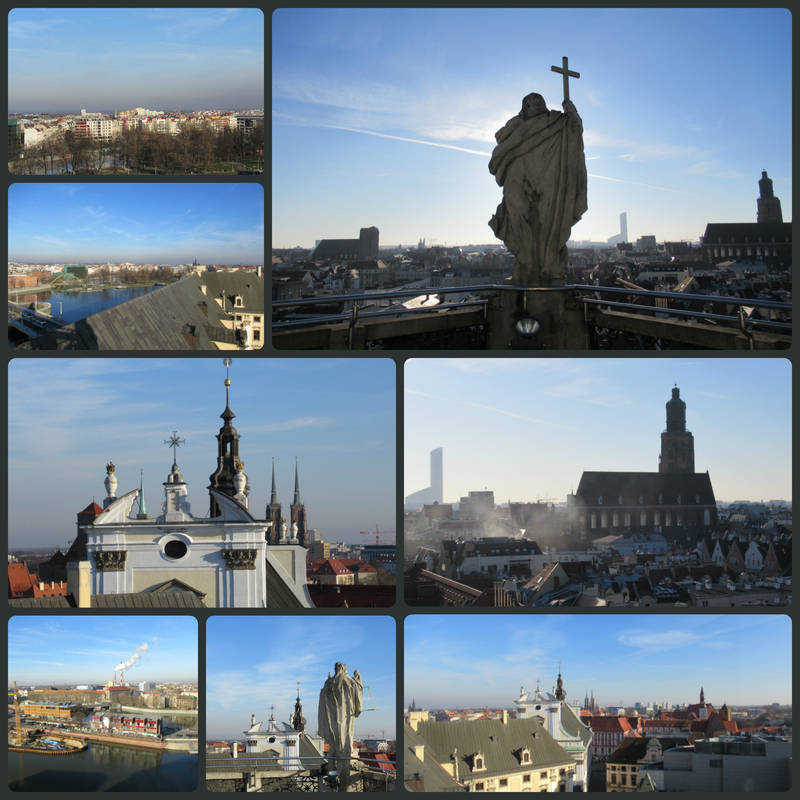 A ferocious wind blew us in to Wroclaw* airport, the landing earning our pilot a well-deserved round of applause. Eager to start our adventure (and the promised hotel shuttle bus proving to be an illusion) we took a taxi. We sped past northern woods. Past car showrooms so new they sparkled. Then, as we neared the city, came soulless blocks of concrete, home to the masses. Women in headscarves, men in caps, packed in old blue-and-white trams. Our driver was a good guide. Points of local interest pointed out. Personal details slipped in along the way. A post-World-War-II baby, he’d seen plenty. And his face – like a thinner Lech Walesa – spoke the volumes he hadn’t time to relate. By now our first day was already waning and after a quick check-in we set out onto the darkening streets. The dismal-looking suburbs had made me apprehensive, but as we ventured into the wintry old town, the magic began to happen. 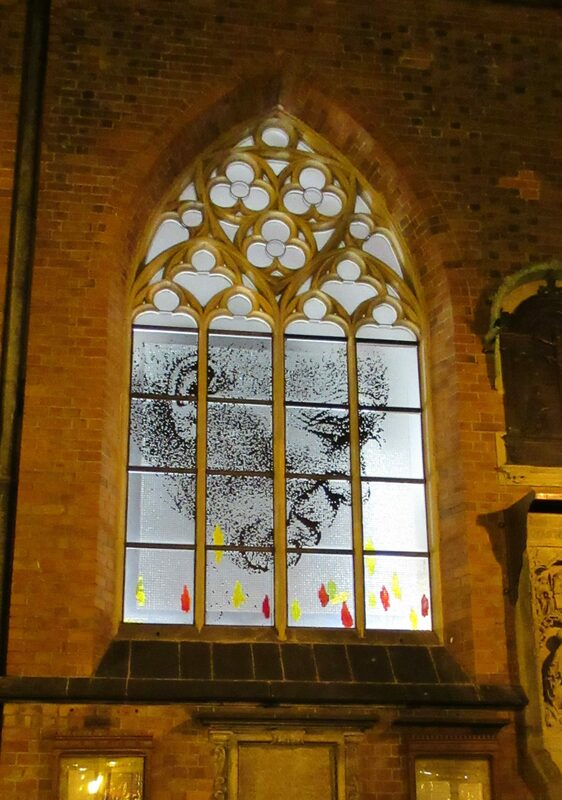 A vast tower loomed over a red brick church, its eerie windows reaching out into the street. A chill inside was not merely physical. The icy fingers of tragedy reached out from the side chapels to touch our human hearts. 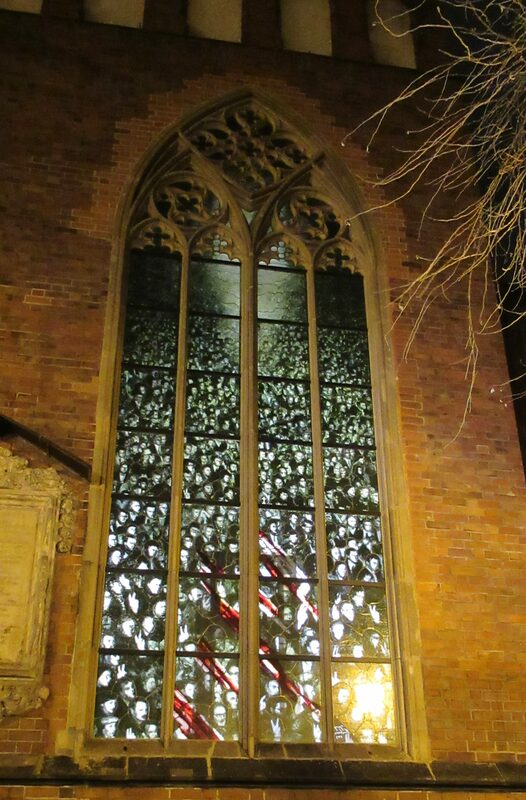 A memorial window dedicated to Katyn 1940. No words can speak of that. The disturbing image of many heads and faces. A grey crowd, marching where? And why? I still don’t know. Tried to find out, to no avail. 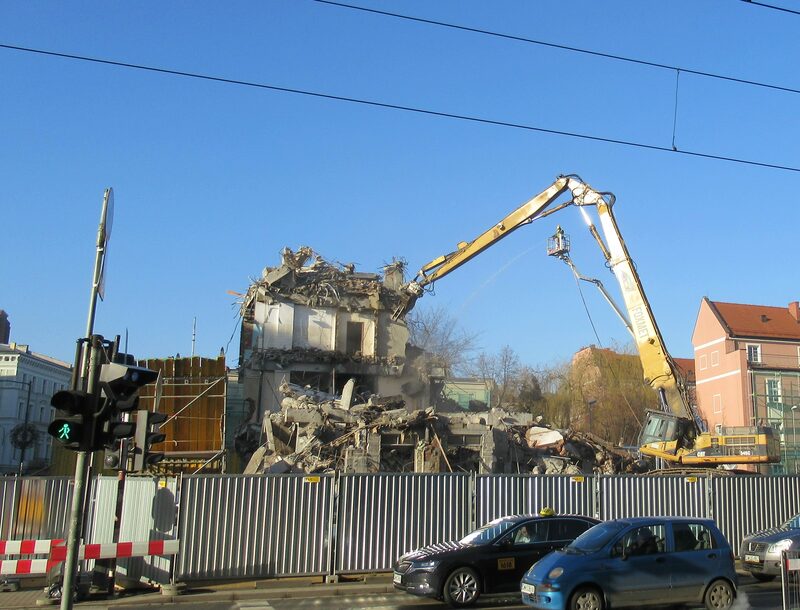 There are some things that Wroclaw doesn’t seem to want to share. And Pope John Paul XXII. A son of the city. A beacon of hope for those in despair, like the Madonnas and their offerings of amber, pearls and gold. This was my first impression. Cold churches and sad, haunted faces kneeling to pray, lighting candles in the darkness. 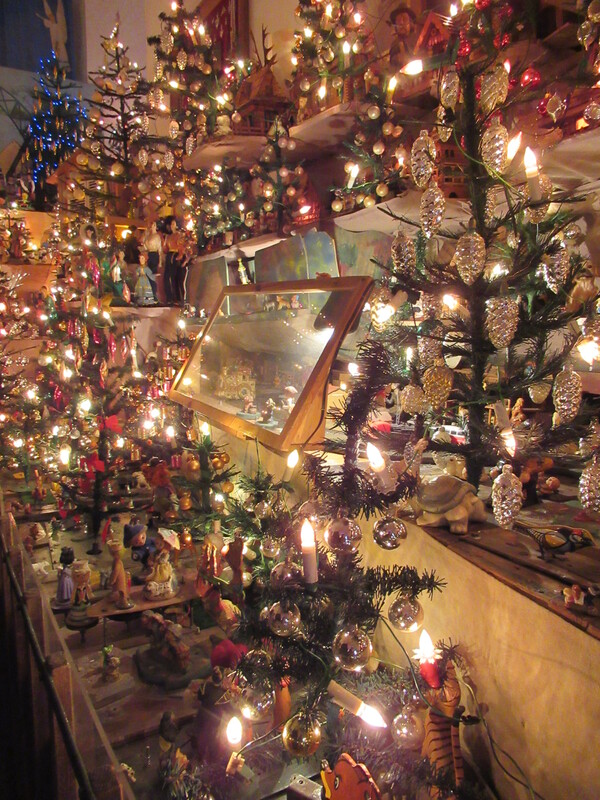 But, striding onwards, jewel-rich Christmas lights revealed a gingerbread house come to life. Streets bustling with people, hatted and coated, mittened and booted. Going places or nowhere, seeing things or rushing home. We found a place to eat. With some difficulty. Despite a full hand of street maps to help us on our way. I always rely on the expeditionary man to navigate my way round strange places. If you ask us both which way to go, then always, always, trust his answer, that’s my advice. But something went wrong with his sixth sense in Wroclaw. It took two days to work out why. It was simple. He needed to know which way the north lay. I tried drawing an arbitrary north on one of the better maps we’d acquired. He sniffed the air, like a beagle seeking the trail – and sighed. We found our way, after that, when he recognised it for himself. But as for the rest of our wanderings – I’m going to let pictures and captions do most of the telling. I can’t do any better with words. It was both a magical and a disturbing experience. A swashbuckling history of heroic resistance – or dreadful inhumanity – depending on your sympathies. From the tenth century onwards, this place has been tossed – or offered itself – from nation to nation, ruler to ruler, warlord to warlord – like some chip in a high-stakes gambling den. Poland, Germany, Prussia, Bohemia, France, Sweden and – of course – the USSR. Before the states and princes, the Tartars’ galloping hordes. Its recent past is one the liberal west warms to – the rise of Solidarity, the election of 1989, the victory of Lech Walesa in the presidential election of 1990. The transition to a post-communist state. The entry into the EU. And this beautiful old city is a monument to resurrection. A phoenix-like community, rising from its own ashes, again and again. In the case of its Jewish inhabitants, literally so. The citizens of Breslau (as Wroclaw was in its German days) welcomed the National Socialists. 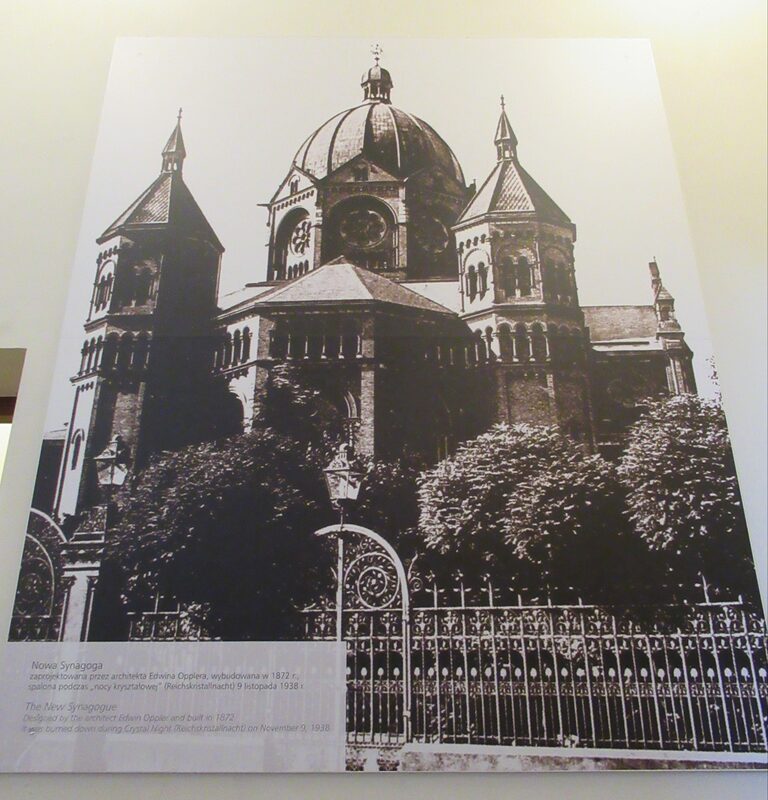 On Kristallnacht in 1938, the grand old synagogue was burned to the ground. 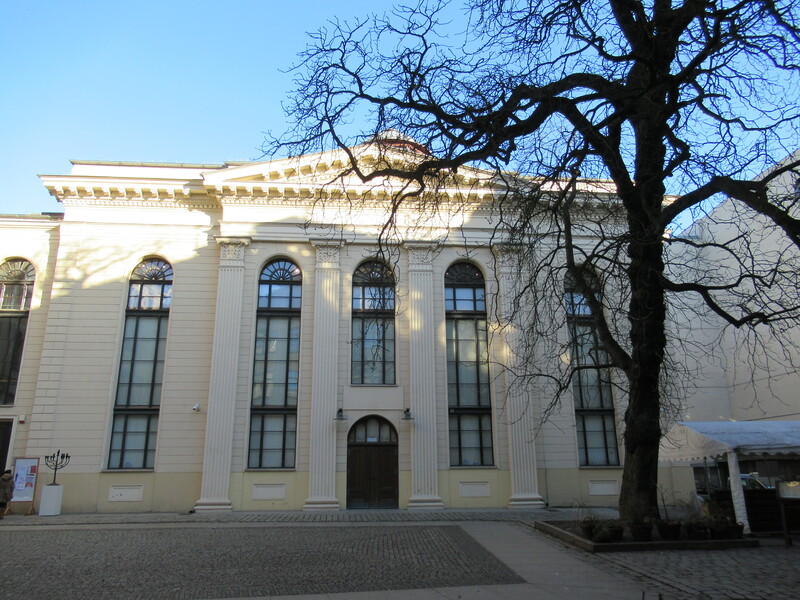 Now, The White Stork Synagogue is resplendent in its calm façade. But it enshrines yet more tragedy. Individuals. Families. Masses. Innocent lives lost to fear of the other, to intolerance, cruelty and genocide. Most chilling of all was realising that the last (let’s hope) state-inspired exodus of Jewish people from the city happened as recently as 1968. There are all sorts of reasons the why the guide books might be reticent about certain things. Perhaps the omissions are accidental – or perhaps the pain is too deep. Or the shame. Or, possibly, pride gets in the way. I don’t know and don’t purport to know. 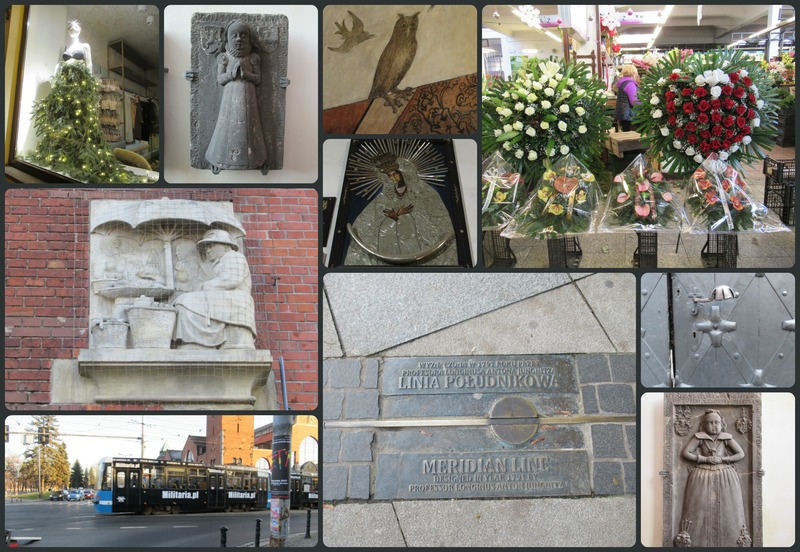 I do know we saw a host of poignant, breath-taking, glorious, quirky things in Wroclaw. This ancient university city has espoused learning, embraced beauty, championed the new and cherished the old. Its rebuilt city a monument to its own belief in itself. Yes, the city casts long shadows. But here’s the thing about shadows – if you listen to what they’re saying, they help you find your way. 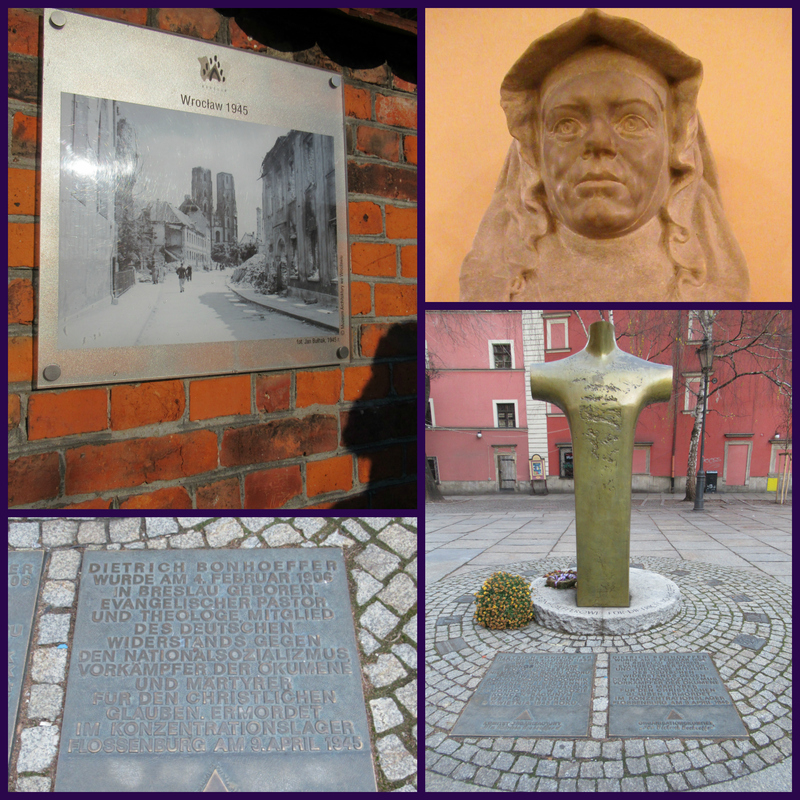 At the top left a picture of the damage inflicted on Cathedral Island in World War II; right, a bust of Edith Stein, also known as St Teresa of the Cross, in Wroclaw town hall. She was born in Breslau, now Wroclaw, into the Jewish faith and later became first an atheist then converted to Catholicisim. Edith was a philosopher and she eventually became a nun. The Nazis took her from her convent in the Netherlands to Auschwitz where she died in 1942 in the gas chamber. Dietrich Bonhoeffer, also a native of Breslau, was a Lutheran pastor and theologian active in the resistance in World War II who has had a profound impact on the Christian church- he too died at the hand of the Nazis, being executed at Flossenburg in April 1845. 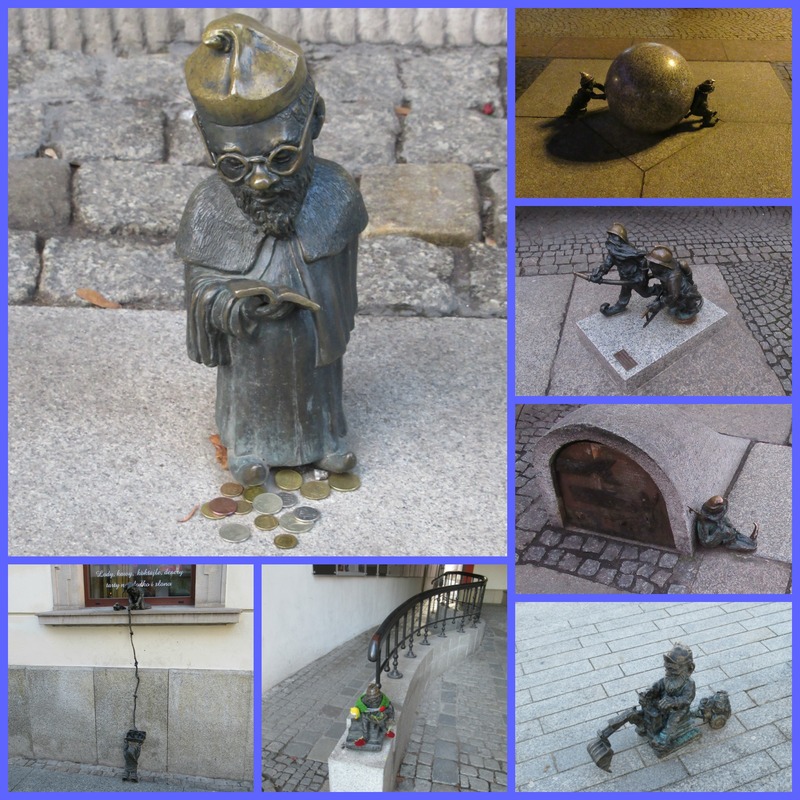 All around the old town you’ll find these little dwarfs but, cute as some of them are, there’s a deeper meaning behind their presence. The first dwarf was painted on a wall in 1982 and was a symbol of the resistance to the Communist regime. Rising above the city streets are the restored (after over 50% being destroyed in WWII) towers of St Mary Magdalene, founded in 1359. A bridge links the towers and many steps lead to it – I have vertigo but had to do it. Note the characteristic red and green roof. All from the old town centre except the top right image from Cathedral island. The narrow blue building was our drinking spot, Academicus bar. 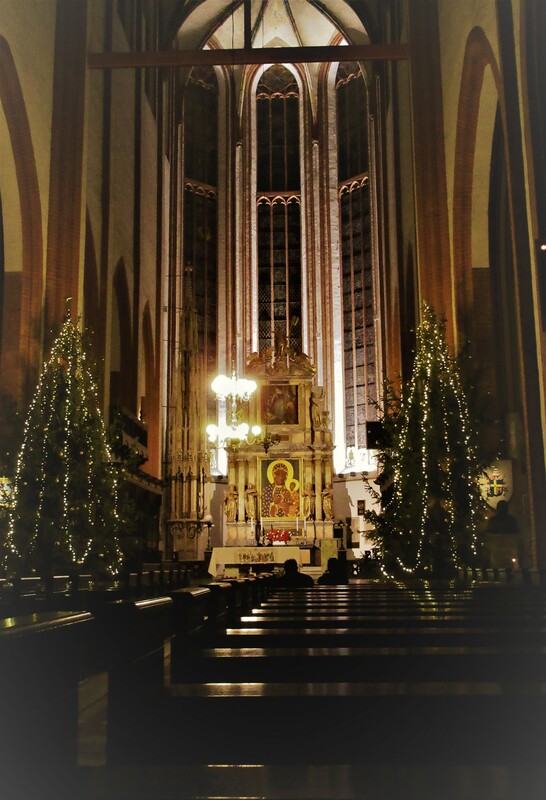 The tower is of St Elisabeth’s church – the place I found most spiritually evocative – sparse decoration and severe windows and side chapels but a very beautiful altar. Couldn’t find out what the black figures on the corner building were all about. Cathedral island. The twin-turreted cathedral itself left me unmoved despite the heroic endeavour of its rebuilding after WWII. All the other places I wanted to see where shut. The river Oder was looking very beautiful though. The red brick building linked by a kind of bridge has a legend attached – the ‘dumpling gate’. I’ve run out of steam or I would share it! I had to include this, taken somewhat surreptitiously I must admit, I felt guilty, in the Church of the Blessed Virgin on the way to Cathedral Island, In a side chapel is a massive nativity display – the Rocking Crib (there is one) – a display of lights, animations (old fashioned) and dolls/toys – very touching and very popular but imagine dusting it. 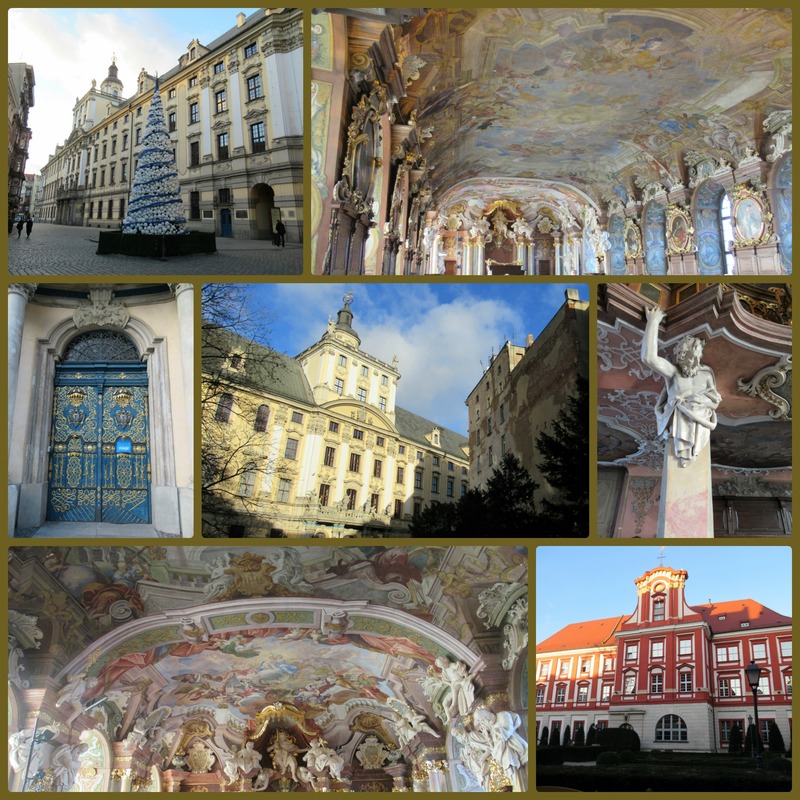 This entry was posted in Art, jaunts & going out, Travelling and tagged baroque, Breslau, Dietrich Bonhoeffer, dwarfs, Edith Stein, Europeam Capital of Culture 2016, Mama Manousch, White Stork Synagogue, Wroclaw, Wroclaw University. Bookmark the permalink. Thanks; very evocative! I do think your ‘travel writing’ is brilliant and tonnes better than the stuff I read in the travel supplements. Were you there for any academic meetings or for a pure holiday! ? So much to see /absorb in this post. Appreciate all your time composing it – and your impressions/observations. There is magic – and sadness. I love architecture – even the “ordinary” buildings. (but Baroque is a bit overwhelming) That nativity scene so lovely and extensive, but as you say, the dusting must be time consuming . But the stories told with it over the years – would be so interesting to be able to be a fly on those walls listening. Your travel post is much better than so many – Cool! Really interesting blog, makes me want to drop everything and visit. 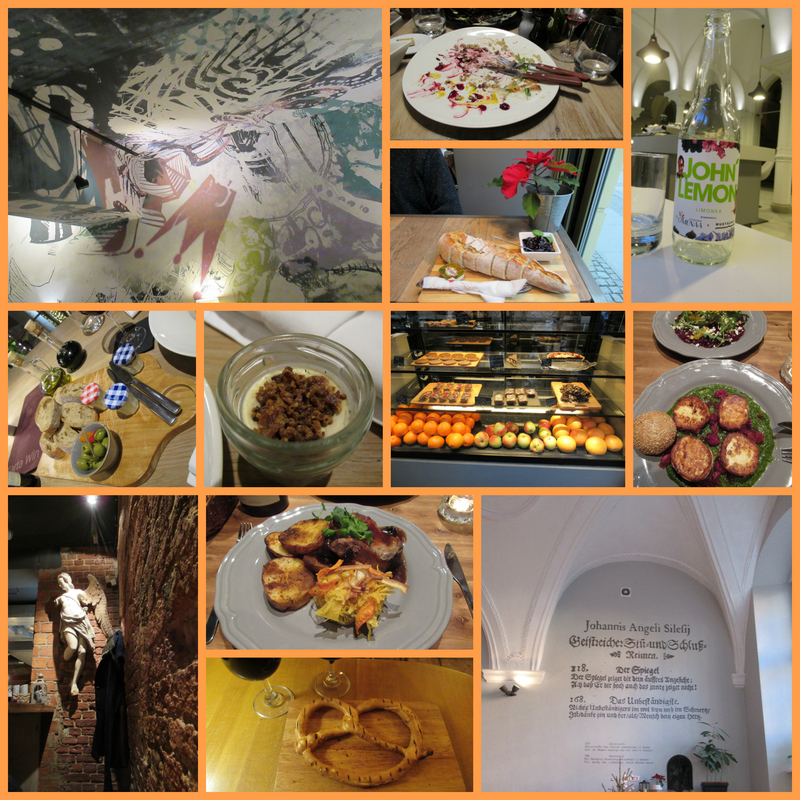 We went to Krakow a few years ago, and found a similarly evocative (and tragic) past history, together with some beautiful architecture – and good food! Lovely photos too – your new camera I take it! I loved the little dwarves, especially the one with the tiny knitted cape and booties! What a complicated and fascinating part of the world. Thanks for sharing your trip. Thank you for writing this . 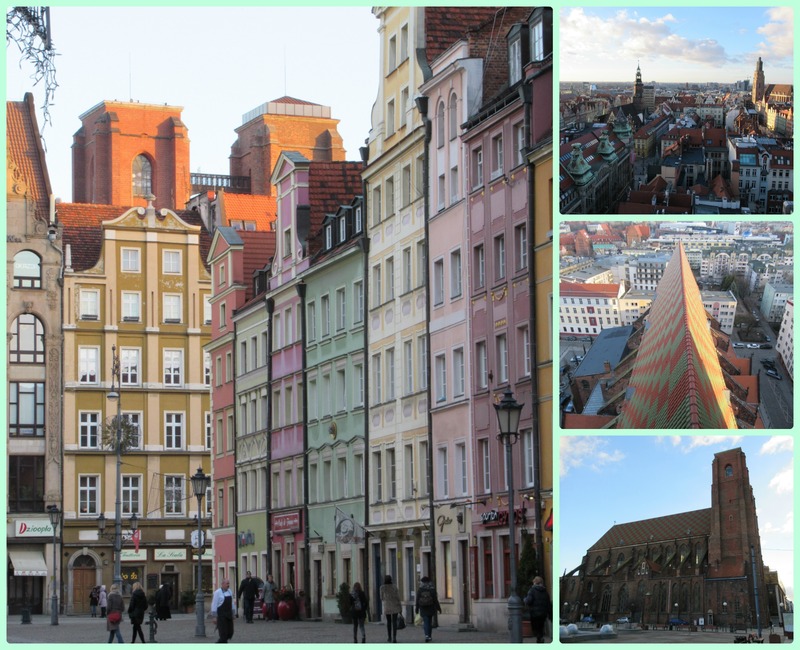 This is such good background material for me, as I’m writing about Poland (even though my novel does not go to Wroclaw). 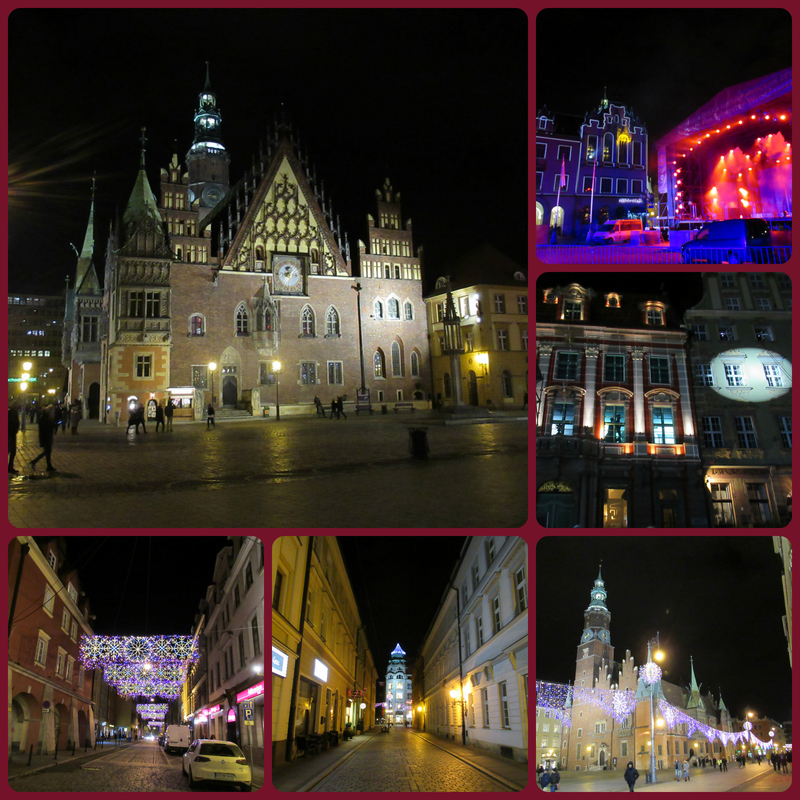 Didn’t know Bonhoffer was a native or about Wroclaw’s participation in Kristallnight. 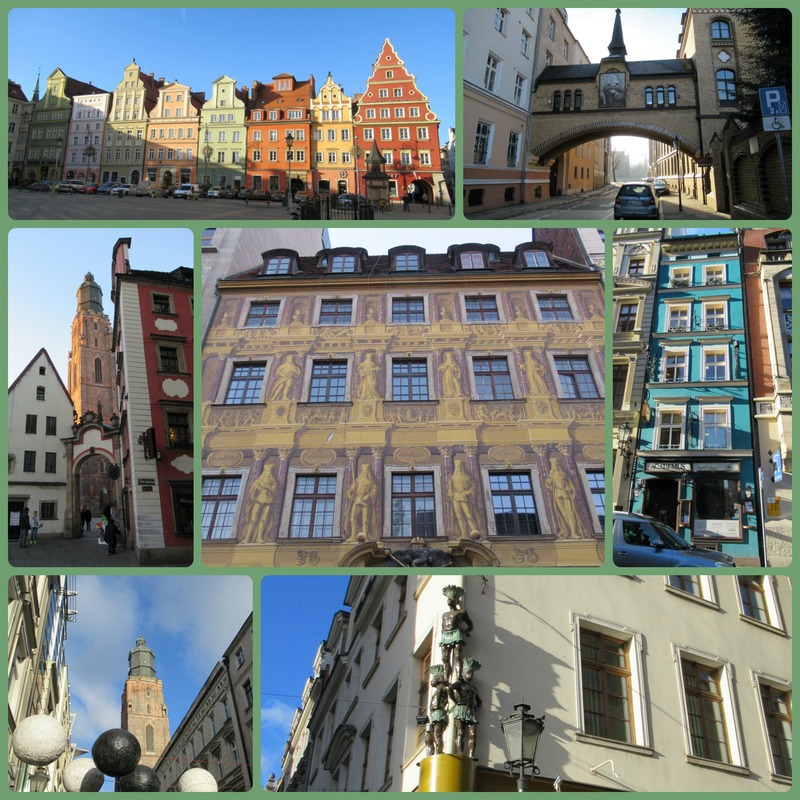 We visited in 2008, staying in Szczecin, Gdansk, Czechostowa, Bielsko-Biała and Krakow. What I do remember, from when we visited, were the German wording on railway stations and the like, especially in Bielsko-Biała. The receptionist at the hotel in Gdansk warned us not to go to Bielsko-Biała, that it wasn’t a nice place to go, but then he was presiding over an establishment whereby (in our room anyway) you had to climb over the toilet to reach the wash basin. Over the road (in a private house) an armchair was being displayed in a glass showcase, several feet off the ground. And when we visited Westerplatte (where the Nazis first landed, thereby precipating WW2), the sound system on our ferry was playing The Spinners in Polish. I found the churches chaotic, in a good way, because they were being used, rather than being museums (as some of our cathedrals tend to be). Fortuitous timing – and glad to be of use 😉 I’m fascinated by what you say about the armchair (and other things too but I have a clear image of the display chair in my head). It’s a country that obviously has a lot of undercurrents – some not so under. An old college friend of mine told me in response to this that her next door neighbour here in the UK is from Wroclaw but rather than have to explain it tells people she’s from Austria. In the context of 20th c history I do find that odd. Yes, I agree about the churches – I loved the ‘real’ churches we went into, there was a rawness about them, the emotion very near the surface. And well used. In one a priest was vacuuming the side aisle and signed to my husband to take off his hat (it was so cold he bought a furry hat). The rocking crib scenes were really touching, so old fashioned but a real and massive labour of love – and plainly much loved by families who were flocking in to see it. I did feel a bit of shame at being there as a tourist. I’d like to go to other places now – and also the the parks where the bison and wolves live. Have a wonderful time in India. Stay well.